Just yesterday my boys and I were talking about prayer journals. I used to make these for my students when I was teaching kindergarten. So, I offered to make the boys one and they were very excited. I took a piece of paper and drew lines to divide the page into four quadrants. Draw and/or write about something for which you are thankful. The last square is for anything else the child would like to pray. Another thankful prayer. Another person in need of a blessing. An opportunity to ask for forgiveness. (This can be really unclear for kids under about 7. They can usually point out others' needs for forgiveness, but not always their own.) Or just something they know about God. Once the squares were finished I helped them actually pray what they had drawn and/or written. It works for us! 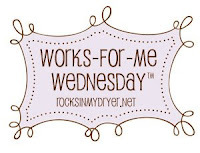 Check out Rocks in My Dryer for more Works for Me Wednesday Tips! Great idea!!! Do you then store these in binders?? I love to keep all my prayer journals. Its fun to go back and see how God answers our prayers! Ooooh, I like this idea! I've been needing something fresh for our morning devotions, this would be great! I love love LOVE this idea!!!!! What a wonderful idea. I liked Micah&Katie's idea of storing in a binder, too. Congratulations! You've won a pair of Lock Laces elastic shoe laces! You have until Wednesday (2/18/09) at noon (EST) to get back to me with your color preference and your mailing address. You can email me at momaloy(at)gmail(dot)com.